In Secrets of the Southern Table, award-winning chef and cook book author Virginia Willis takes you on a tour of today's South - a region rich in history and cultural diversity. With her signature charm and wit, Virginia shares many well-known Southern recipes like Pimento Cheese Tomato Herb Pie and 'Cathead' Biscuits, but also some surprising revelations drawn from the area's many global influences, like Catfish Tacos with Avocado Crema, Mississippi-Style Char Siu Pork Tenderloin, and Greek Okra and Tomatoes. In addition to the recipes, Virginia profiles some of the diverse chefs, farmers, and other culinary influencers who are shaping contemporary Southern cuisine. Together, these stories and the delicious recipes that accompany them celebrate the rich and ever-evolving heritage of Southern cooking. 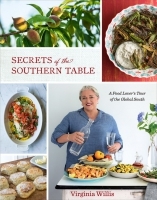 Recipes and stories of the modern South.